Intel will release Core M processors this year based on its new Skylake chip design, allowing for thinner Windows tablets that might compete better against Apple’s latest iPad Air. The new Core M chips are due in the second half of the year and will also extend battery life in tablets, hybrids and laptop PCs, Intel CEO Brian Krzanich said at the Goldman Sachs Technology and Internet conference Tuesday. The thinnest tablet with a Core M processor today is 7.2 millimeters thick, and the thinner designs should help Intel challenge Apple’s iPad Air 2, which is 6.1 millimeters thick. Thinner tablets are generally lighter and easier to carry around. Its current batch of Core M chips, introduced last year, are based on the Broadwell microarchitecture. The Skylake chips should also improve graphics and general application performance compared to the current processors. 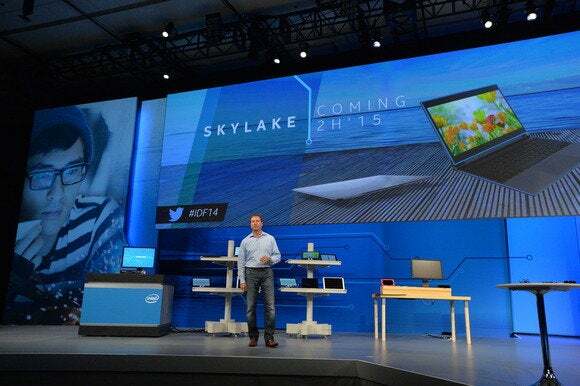 The Skylake chips will be able to run Windows 10, as well as Google’s Chrome and Android OSes, Krzanich said. But most existing Core M systems run Windows 8.1, and Intel has said device makers haven’t shown a lot of interest in other OSes. So most Skylake devices will probably run Windows 10. Intel may give more details about the new Core M chips in June at the Computex trade show in Taipei, where it introduced the first Broadwell-based Core M chips last year. Skylake systems will also support the second generation of Intel’s RealSense 3D camera technology, which uses a depth sensor to create 3D scans of objects, and which can also be used for gesture and facial recognition. The current version is used in a handful of products including Dell’s Venue 8 7000 tablet. PC sales are recovering gradually after years of decline, and Intel hopes Skylake will tempt people to go out and upgrade their systems. It wants to get Skylake to market quickly and close the curtain on Broadwell, which was delayed early on due to manufacturing problems.